How to build the Super Chimney? Unfortunately, the idea of building the Super Chimney has never received a welcoming reception despite of all the promised benefits. The biggest point of criticism has always been that it is impossible or impractical to build such structures at the present stage of technology. Different types of natural support systems were considered, such as building it inside a mountain, canyon, etc. None of those designs was easy or inexpensive to build. Figure 1. 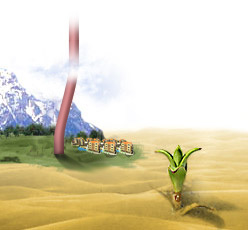 Schematic depiction of flexible chimney Not up to scale. A chimney which is 5000 m tall and 10m in diameter , and which is equipped with a mushroom cap, can expect upward force of 1473 kN and can support 147,3 tons of its own weight. That gives roughly 30kg/m of the construction. (See Attachment A: Calculations). If that weight limitation is unattainable or we want some safety excess, we can increase chimney's diameter. For example, if we make diameter of 20m we will have upward force 4 times stronger and therefore each meter of such chimney can be up to 120 kg.. Clearly we will have enough upward force to support our construction. Moreover, we can always increase the Upward Force by increasing the diameter. (See Attachment A: Calculations). How to erect the chimney: Chimney should be erected like a hot air balloon. First, the flat chimney tube is laid over the ground. The mushroom cap openings are closed. We start pumping hot air from the lower end directing it towards the mushroom cap. If we pump chimney with sufficiently hot air and heat losses through the walls are low, the resulting buoyancy will be enough to support such structure. (See Attachment A: Calculations). So, We can erect chimney up to 112 tons or more than 20 kg/m for 10 meters diameter chimney. For 20 meters diameter it will be 450 tons or 90 kg per meter of the chimney. How it will withstand strong side winds: At 5000m altitude winds can be very strong up to 100 km per hour. However, it is still 5 times less than wind speed inside the chimney (air flow). Therefore, the chimney should not tilt more than 20 degrees of its position perpendicular to the ground surface, which is roughly one fifth of its range of 90 degrees. 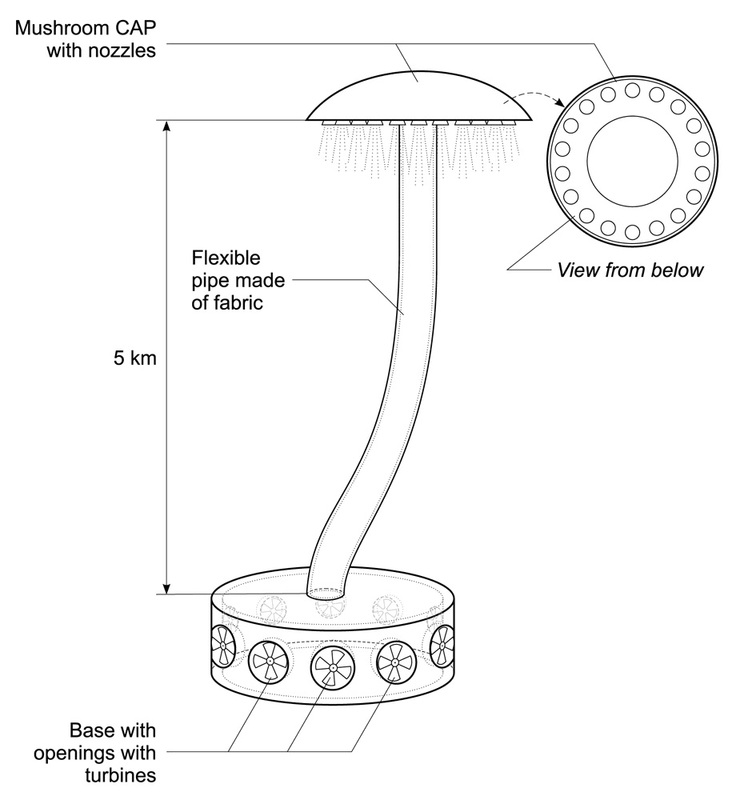 Additionally, nozzles of the mushroom cap can be directed to blow exiting air in a direction against the wind, which in turn will lessen tilting..
Material The chimney should be made of multilayer fabric. 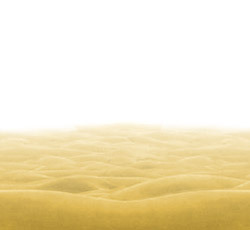 Those layers will be similar to the materials used for hot air balloon, with additional layers added for reducing heat loss and adding strength. Most likely chimney will need outside harnesses and ropes to increase strength and to keep it attached to the ground base. Price It is difficult to estimate the price at this point. Materials should be more expensive than those used for hot air balloons, since they have to be multilayered. Even if they are ten times as expensive the price should be under 10/ m2 (see http://www.alibaba.com/showroom/hot-air-balloon-fabric.html). To build 20 m diameter chimney would require as much fabric as 300,000 m2 of fabric or $3,000,000. Outside roping, mushroom cap, ground base, labor and machinery to inflate will increase the price. However, I do not see it bringing above $5 million. Thus, if 25,000 chimneys of such size are enough to stop global warming, the investment will be less than 1,250 billions (annual US budget deficit). Furthermore, as we get more experienced with building super chimneys, we can make them more powerful by making them taller and wider. The benefits will be millions of acres of arable land in deserts around the world, fresh water, electricity etc. It is quite possible that we can end up making profit on solving Global Warming problem.